Iven Mareels was born in Aalst, Belgium, in 1959. 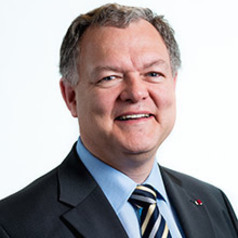 He obtained the Master of Electromechanical Engineering from Gent University in 1982 and the PhD in Systems Engineering from the Australian National University in 1987. He joined the University of Melbourne in 1996 as the Professor of Electrical and Electronic Engineering and was appointed Dean of the Melbourne School of Engineering in 2007, a position he left in Feb 2018 to take up the role of Lab Director of IBM Research Australia. Iven has extensive experience in consulting for both industry and government. In May 2008, he was awarded the ATSE Clunies Ross Award by the Australian Academy of Technological Sciences and Engineering (ATSE) for a new approach to managing large scale open channel water distribution networks. He has received a number of awards for his research publications. He was awarded the Centenary Medal (2003) and in 2011 he became a Commander of the Order of the Crown (Belgium) both for his contributions to engineering research and education. His research focuses on large scale systems (modeling, analysis and design). Typical examples of large scale systems are the electricity grid, water distribution networks, and neuronal networks (like our brain).